TravStar1 Point Of Sale SystemRegister Manual Gas TransactionsHow Can I Stop the Dispensers in Case of Emergency? How Can I Stop the Dispensers in Case of Emergency? This lesson will teach you how to stop all of the dispensers in case of an emergency. From the dispenser screen, touch the "Add'l Fuel Functions" button. Touch the "Emergency Stop" button. 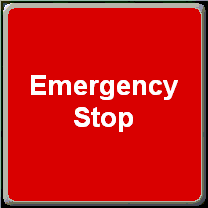 You will be prompted to confirm the Emergency Stop. (1) Touch the "OK" button to stop all dispensers. 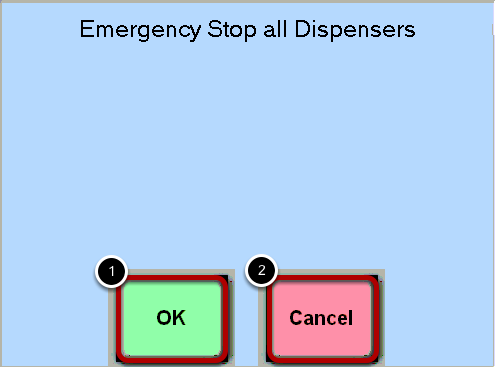 (2) Touch the "Cancel" button if the "Emergency Stop" button was touched by accident and you do not want to stop the dispensers. Your dispenser icons will now have red circles over them. If you touch one of the dispenser icons, you will see that the status has changed to Stopped Off hook. When the dispensers are Stopped they cannot be authorized. Prev: How Can I Create a Fuel Transaction Manually? 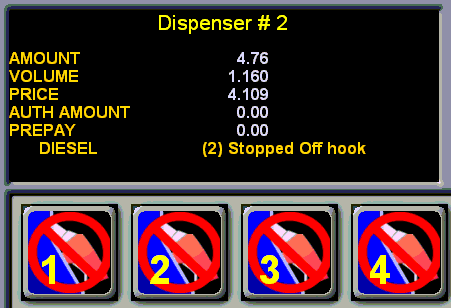 Next: How Do I Restart the Dispensers after an Emergency Stop?